As you're probably well aware, with the launch of the iPhone 7 Apple ditched the familiar headphone jack in favour of a wireless audio option. Many people have questioned the sense in this 'courageous' decision which has led some owners to take drastic steps to allow them to use their favorite set of wired headphones. Some have been spurred on by a YouTube video that reveals a 'secret hack' for returning the headphone jack to the iPhone 7. YouTuber TechRax has created a tutorial for uncovering the hidden jack that Apple left inside the new phone. Except, of course, it is complete nonsense. 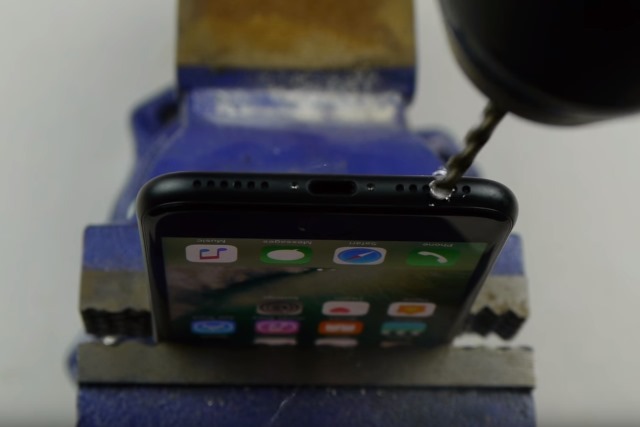 In his video, TechRax can be seen securing his iPhone 7 in a vice before drilling into the speaker grille to access the 'blocked' headphone jack. It is, obviously, a spoof video, but it's not clear if it has been created with comedy in mind, or if it’s rather more mean-spirited. Needless to say if you attack your brand new iPhone 7 with a drill, you're not only going to fail to discover a headphone jack, you're probably going to end up destroying your phone. When you're done watching, have a read through the comments which are sure to raise a smile. To reiterate -- just in case there's any doubt -- the 'tutorial' does not work. Do not follow the instructions, just revel in its stupidity.